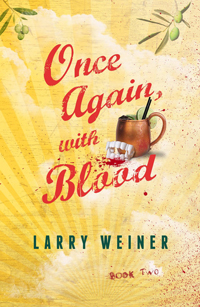 Larry Weiner's debut novel Paradise Rot (2014) is the first book in his island trilogy, followed by Once Again, with Blood (2014) and his soon to be published as of yet untitled finale. The series' protagonist is former ad man Kyle Brightman who takes a job as art director at a mysterious new resort in the Caribbean only to discover his newfound paradise is a nightmare full of unpredictable events and crazy characters - including a seductive jungle assassin, her partially paralyzed talking Chihuahua, an Ivy League Rastafarian seaplane captain, a former Haliburton mercenary, and a French tavern owner with a fondness for goats. And did we already mention the zombies?! Once Again, with Blood picks up where the first book leaves off. 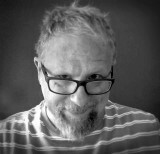 Fellow Bainbridge author Kenneth Bennett says that "Weiner writes with a smart, fun, electric style in the vein of Dave Eggers or Chuck Palahniuk". 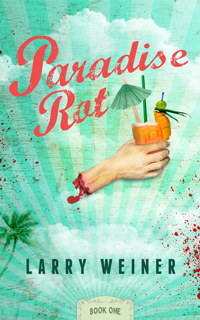 For more information on this author go to http://www.larrynweiner.com/.